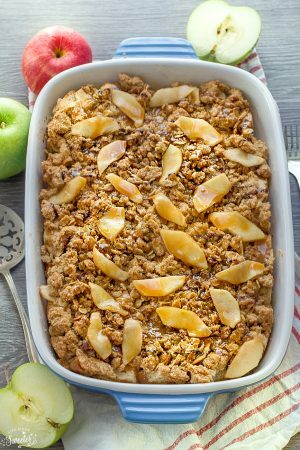 Cinnamon Apple Baked Oatmeal makes the perfect easy make-ahead breakfast or brunch! Best of all, it comes together in just one bowl using healthy and wholesome ingredients. Gluten free & refined sugar free. Plus a step-by-step video. 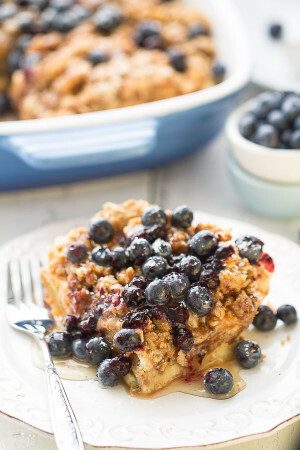 Pin for later AND follow my Recipes Board for more breakfast ideas! When it comes to your breakfast routine, are you a creature of habit? I totally am and will usually have the same thing every morning starting with a green smoothie followed by a bowl of oatmeal after my workout. During the summer, it’s overnight oats and in the winter, I’ll switch things up with a hearty bowl of steel cut oats. My kiddos on the other hand? They think this Lemon Blueberry, Pumpkin and Berry Baked Oatmeal are the best and and would even have them for lunch or dinner if they could. I don’t mind since I love that I can make a big batch on Sunday nights. It keeps well in the fridge or freezer to reheat throughout the week. 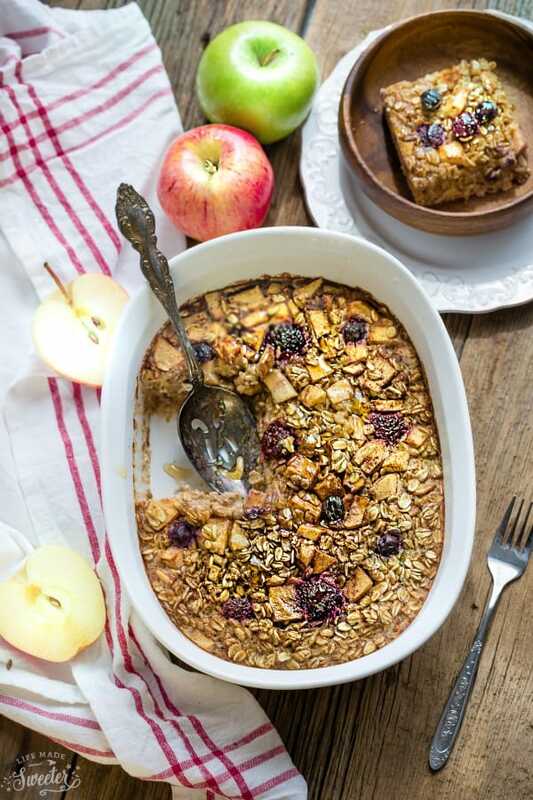 With back to school starting for us in a few weeks, this Cinnamon Apple Baked Oatmeal makes the perfect easy make-ahead breakfast. ground flax seeds extra fiber. A few eggs bind it all together, and the cinnamon and allspice give you that cozy fall feeling. I couldn’t help topping mine off with a few blackberries and blueberries for some extra color but you can easily leave them out. Or add whatever fruit you have on hand. Some toasted nuts or a streusel topping would also be great as well. 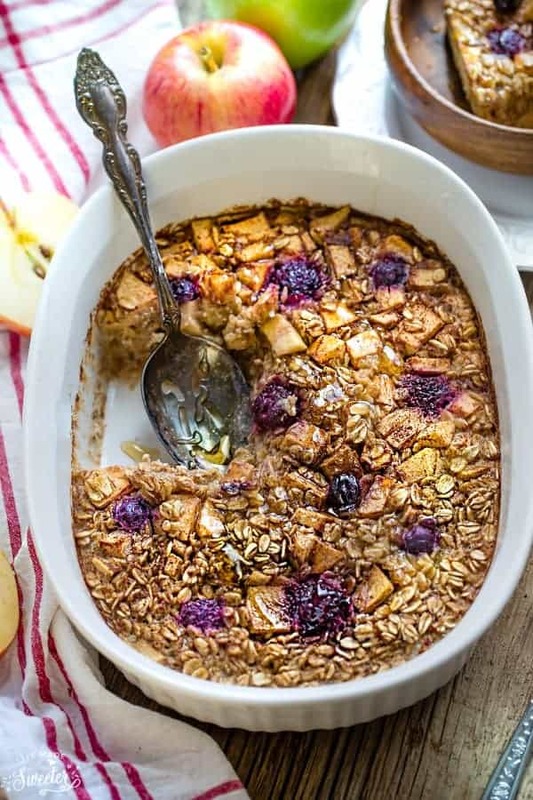 This baked oatmeal literally takes just a few minutes to throw together and then only needs about thirty minutes in the oven. Plus, since dishes are my LEAST favorite thing to do, you can see from the video that this recipe comes together easily in just ONE bowl. No need to mix your dry ingredients and wet ingredients separately. It bakes up just as delicious. 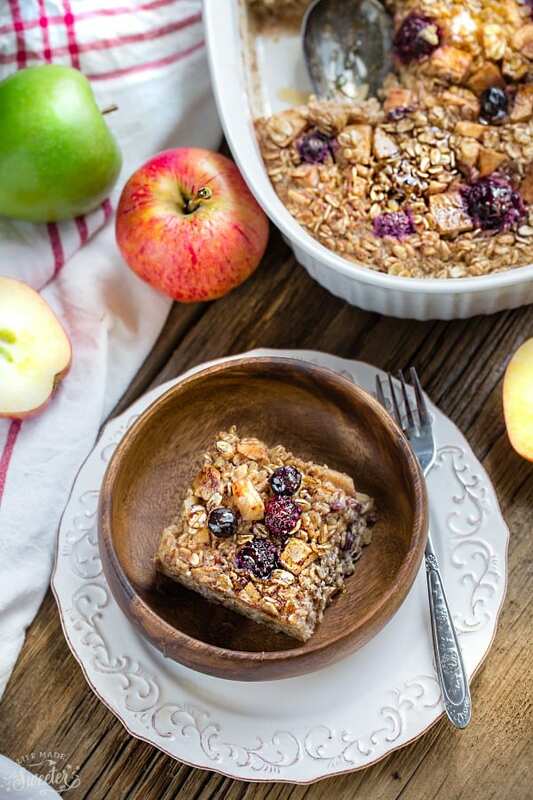 Make it in the evening or on your Sunday meal prep day, then store it in the fridge and you are set up with a few hearty and healthy breakfasts that you can serve during the week or even on the weekend with a big cup of tea or juice. 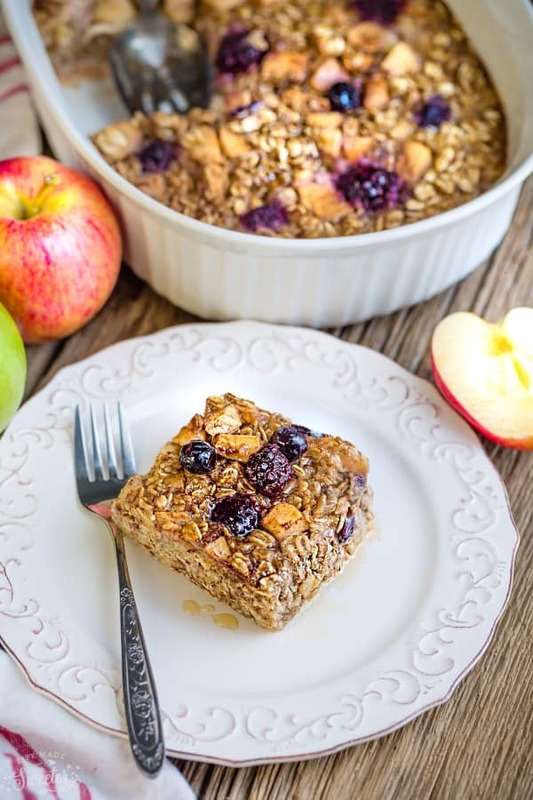 Cinnamon Apple Baked Oatmeal makes the perfect easy make-ahead breakfast or brunch! In a large bowl, whisk the eggs and milk until combined. Stir in applesauce, maple syrup, vanilla, cinnamon, allspice and flax seeds. Gently fold in oats and apples. Spread batter evenly and top with berries.